Further to sites such as nin.ru, nin.fr and nin-au.com, wraith wrote in to tell us of a (primarily) UK-based forum for all things NIN. With the impending demise of the spiral a collection of it's members have set up a new (free) site with forums, a chat room and hopefully more to come at www.nineinchnails.co.uk. We hope to get as many nin fans as possible, both ex spirallers and otherwise, to make it a regular haunt. Although it's based in the UK it's an international site with members from the UK, Germany, America, Canada and Australia already signed up. Danny Conrad wrote in to tell us that both Circuit City and Best Buy have a version of ghosts up for sale in the $130-150 region. Inflated version of the deluxe edition, or something new for the collectors? Also, 29k (and some other people) sent in this link to a Japanese version of The Slip apparently up for sale on the HMV Japan site. NIN.com has updated its tour dates with an August 25th show in Toledo, OH. The show will be held at the Seagate Convention Centre. Pre-sale tickets for the show are available on June 3rd through NIN.com, while the public on-sale date is June 6th. I know I'll be there. Will you? Music Rising, a charity created by The Edge from U2 and Bob Ezrin (among others) is having their second "Icons of Music" charity auction. The auction aims to raise funds to revive the music culture in the hurricane devastated Central Gulf region of the USA. Among the loads and loads of memorabilia up for auction (anyone fancy Elton John's toaster or Bon Scott's bomber jacket?) are two NIN items - a signed Minimoog Voyager synth and a very nice signed custom Gibson guitar. I just wanted to send you all an update on your Faction orders. Jason is adhering to the time line that he was given. In the last two weeks Jason has sent out roughly eighty orders. Some of you are part of these orders and have already received your merchandise or refunds. A large shipment will be going out this week which will take care of most of the rest of you. The final orders will be filled and sent out the last week in May and the first few days of June. I know that most of you have been waiting for your orders for over 7 months. I assure you that Jason is working hard to take care of all of you in the next week or two. Jason is fully aware of the consequences if that does not happen and I do not suspect that he will fail in his agreement. As a side note there are many more people waiting for orders than those who are receiving this email. I am aware of the outstanding orders and Jason is working on all of his orders not just the orders of those people that have received this email. iTunes has something new for NIN? The iTunes music store added something new... a while ago (Honestly, I'm not sure when this happened). There's a new podcast that links to the highest ranked remixes from remix.nin.com. A link to it can be found here. It's a neat way to check out what's happening on the remix site without having to deal with some of the problems and glitches the website has had since its opening. Beta2k just posted a fantastic COMPLETE audio interview from a Vienna radio station from the 30th of March 2007, the day of the second Gasometer show, over at ETS. Thanks very much to Beta2k! Cody wrote in to tell us that while working at Barnes & Noble, he discovered the street date for NiggyTardust to be June 24th. Awesomely enough, the same date is listed on Saul's website and it seems to imply that the $5 download is only available until the 24th. So, if you're cheap/poor/whatever, you'd better buy it soon. Thanks to Cody and Ragnarok for the heads-up. nin.com has just posted new links at The Slip for corrected 24/96 WAV and FLAC files. "Yay!" if you're an audiophile! Also added were two gray boxes; one under the NIN logo and another under the RSS feed box. Further investigation reveals that they're aesthetically pleasing to the eye since they line up with the added text to the original "HALO 27" update. Thanks to our compadres who wrote in to let us know. Not strictly NIN-related, but a bunch of you have written in to tell us that forthcoming support act Crystal Castles have been accused of stealing music (by abusing creative commons licenses) for their own songs. Here are some sources. First, Saul Williams has just been added to the already monstrous line up. Secondly, Q101 in Chicago are having many opportunities to try and win tickets to the festival. You can either submit a video or just sign up for their email if you're lazy for the chance to win tickets. More info on the website! Thanks Jeff S and others who wrote in. Now sporting a funky The Slip-esque design. Thanks to yeah1, sebastian and the guys over at ETS once again. 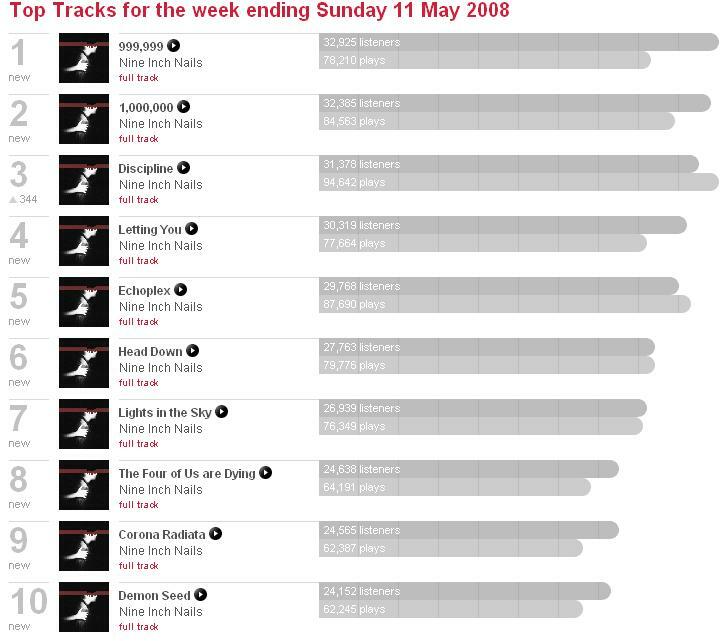 The Slip storms last.fm's weekly charts. Much like when Ghosts I-IV came out, Nine Inch Nails have dominated this week's last.fm weekly charts - all top 10 slots! Thanks to all the geeky ETS members for posting about it. NIN tickets go on sale Saturday morning at 10. Listen, 93X radio tells ya when to text or call to win. My name is Travis Scott and I am an investigator with the Utah Division of Consumer Protection. As you know I am the one that is in charge of the investigation of Faction. First off I would like to thank everyone for all of the email messages, it has been a great help for me creating a nice list of those who still have orders that are unfulfilled as well as building my case and gathering evidence. I apologize in advance if any of you get this email more than once as I may have you on my email list more than once. I spoke with Jason Lynes yesterday 5/7/08 and we have made an arrangement where Jason is getting me all of the information about his orders, inventory and such. At this point a large shipment will be going out this weekend and from there Jason will be reporting to me every week on his progress to fulfill all of the other orders. If he at any point fails in our agreement I have made him aware of the fines and charges he will be facing for violations of Utah State Consumer Sales Practices Act. Everyone will be getting either a refund or their order filled. I ask that as you begin to get refunds or receive your orders that you send me a quick email stating your name, address, and what you received. This is so that I can confirm that Jason is complying. Beyond that I will keep in contact with you of the progress being made. The Slip In The News, again. Also, if you've just received your Ghost I-IV deluxe limited edition a reminder that nin-au is compiling an owner's list, so feel free to send photos of your copy. Thanks Tamara, alex, DiscoBunny, kerplooey, Dan K, Artemisian and anyone I forgot. Ian Rogers' blog at FISTFULAYEN neatly summarizes just about all the major things Trent has been doing in the last year to drive the paradigm of music distribution to new levels. We typically don't post about blog posts like that, but that's a pat on the back from someone who knows what's up. So if you get a moment, Digg it and/or spread the word however you prefer. 42 Entertainment were the People's Voice Winner in *both* the categories they were nominated for in this year's Webby Awards. They were of course nominated for the massive Year Zero ARG campaign. They were successful in the Integrated Campaign and the Other Advertising: Branded Content categories. Well done to 42 Entertainment and thanks to everyone who voted!!! Thanks Adrian for the alert. Thanks to everyone who submitted links. is available for FREE download in multiple (mp3, FLAC, M4A Apple lossless and 24/96 WAVE) formats at nin.com! File contains PDF with artwork and credits. The lyrics are also embedded in the file tags. As many of us who shelled out our $300 earlier this year are now recieving despatch confirmation emails, and in some lucky cases, the product already, this seems like a choice time to mention nin-au.com's Halo 26 Limited Edition Owners' List again. 1) A clear photo of your package's unique number. 2) A clear photo of your package's unique Giclée print. 3) The country you and your item are located in. Hot, fresh new meat, delivered right to your door! Even though you never ordered it! Sorry, no refunds! If you weren't aware nin.com has updated with *nearly* all the presale information for the upcoming US tour. So if you haven't signed up yet and want the chance to secure tickets early you should do so very soon! Released through a Facebook application?!?!?! Again the file tells us to go to nin.com on May 5. The ultra mega super duper Limited Edition 'Ghosts' packages have started to arrive in the arms of lucky purchasers, and they look even better than expected (etched metal NIN faceplate? yowza!) and feature some other unexpected surprises too. EDIT: Also, Ryan over at The Aus NIN forum is compiling an archive of Ghosts LE numbers and who received them (more info here) so please take a second to join up and let him know what unique number you got. Pics are also most welcome. Contact Ryan and he'll do the rest. Virgin Festival line up details are complete, with NIN playing on Sunday August 10. They are $175 for 2 days or $97.50 for 1 day. Thanks to those who submitted the info! Still waiting on an order from factionnation.com/Jason Lynes? Travis, the investigator from Utah, has been in contact with Jason this past week. He would ideally like Jason to refund or ship what he has in 1-2 weeks, but Jason is giving the line "by June 1st". Jason is also supposed to compile a list of outstanding orders. But guess who isn't answering the phone? His lengthy list must have put him in hiding! SO HERE IS THE NEWS!!! TIRED OF FILLING OUT COMPLAINT FORMS?! IF YOU HAVE AN OUTSTANDING ORDER, THEN EMAIL TRAVIS!! keep it brief, no flooding his mailbox - that's what he is afraid of, but I said no worries, we wouldn't do that. Keep it simple and brief and only send one email. These emails will help him verify aleya list and MORE FINES FOR JASON! REMEMBER $2500 FINE FOR EACH PERSON!!! So now is your chance to stand up and be counted if you've still got an outstanding order. As Levi previously reported, 42 Entertainment have been nominated for a prestigious Webby Award this year, for their work on the Year Zero ARG campaign. Its a "People's Choice" award, which means you can vote for the winner. You know what this means! Go to The People's Choice Webby website to register - it seriously took me less than a minute. After entering your activation code, select the "Year Zero" campaign from the "Select a Nominee" drop-down menu on the top-right (for a web-savvy site, its sure damn hard to navigate!). Just to note: 42 Entertainment is nominated for two categories, so make sure to vote for both the "Year Zero: Interactive Campaigns" and the "Year Zero: Branded Content" categories. I promise this isn't as hard as it looks. Also, today is the final day for voting, so please take a couple minutes and vote. We've been getting a steady flow of reports on the exorbitant prices being charged for Nine Inch Nails' tickets via ticketmaster's site. In their ongoing quest to save you money, ticketmaster has apparently partnered with ticket broker TicketsNow. So even though most upcoming NIN shows have not gone on sale yet, you can secure your tickets through a Ticketmaster approved ticket broker now for just 3 times the normal price. It's a shame that there isn't some other way to go about getting tickets. Exclusive pre-sales through the official website would be great. EDIT: A little research has revealed that TicketsNow is owned by Ticketmaster.